On this day (Aug 26) 1875, lawyer-politician-writer JOHN BUCHAN was born in Perth, Scotland. After a brief career in law, Buchan began writing fiction while also pursuing a political and diplomatic career. Although he wrote many genres, Buchan is best known for his spy adventure novels, including the first “Richard Hannay” book entiitled, THE THIRTY-NINE STEPS, published in 1915. He continued to write Hannay novels in his spare time, working full-time in the British Army ‘Intelligence Corps’. In fact, Buchan is credited with starting the kind of espionage thrillers (which he called “shockers”) that would eventually lead to such characters as James Bond. 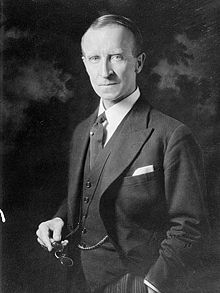 John Buchan died in 1940 at 64, by this time the titled Lord Tweedsmuir of Elsfield and Governor-General of Canada. His son, William, was also an author, and his grandson, James Buchan, recently published his sixth book, the critically acclaimed novel entitled, “The Persian Bride”.